With increasing concerns about the impact of warming temperatures on water resources, more attention is being paid to the relationship between runoff and precipitation, or runoff efficiency. Temperature is a key influence on Colorado River runoff efficiency, and warming temperatures are projected to reduce runoff efficiency. 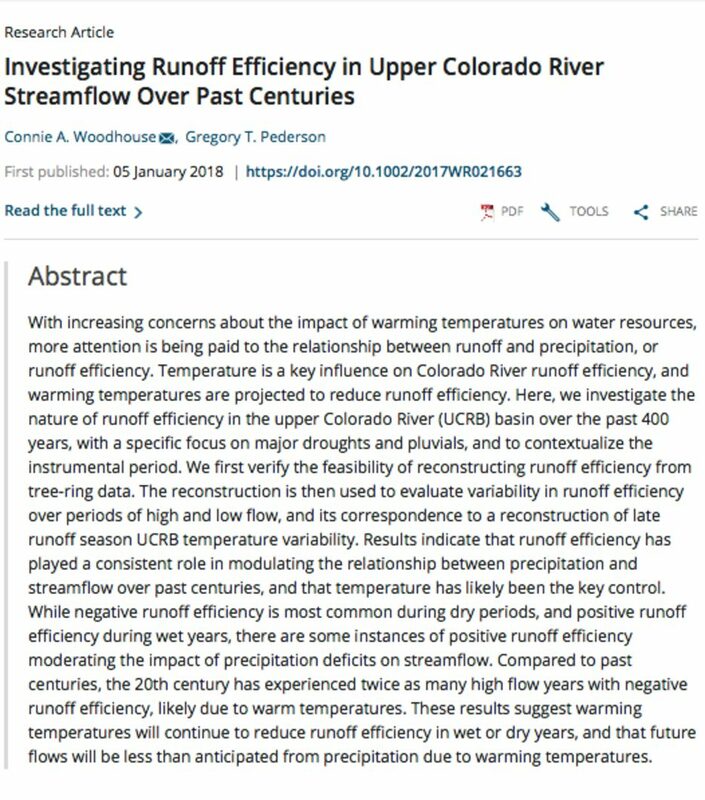 Here, we investigate the nature of runoff efficiency in the upper Colorado River (UCRB) basin over the past 400 years, with a specific focus on major droughts and pluvials, and to contextualize the instrumental period. We first verify the feasibility of reconstructing runoff efficiency from tree‐ring data. The reconstruction is then used to evaluate variability in runoff efficiency over periods of high and low flow, and its correspondence to a reconstruction of late runoff season UCRB temperature variability. Results indicate that runoff efficiency has played a consistent role in modulating the relationship between precipitation and streamflow over past centuries, and that temperature has likely been the key control. While negative runoff efficiency is most common during dry periods, and positive runoff efficiency during wet years, there are some instances of positive runoff efficiency moderating the impact of precipitation deficits on streamflow. Compared to past centuries, the 20th century has experienced twice as many high flow years with negative runoff efficiency, likely due to warm temperatures. These results suggest warming temperatures will continue to reduce runoff efficiency in wet or dry years, and that future flows will be less than anticipated from precipitation due to warming temperatures. 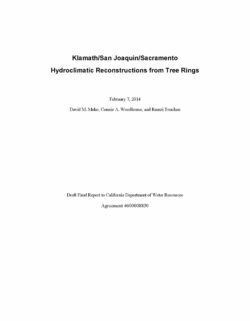 This is a draft final report for Agreement Number 4600008850, “Klamath/San Joaquin/Sacramento Hydroclimatic Reconstructions”, signed October 13, 2010. Work includes developing new and updated tree-ring chronologies, reconstructing specified streamflow and/or precipitation records in the Klamath, San Joaquin and Sacramento River Basins, and analyzing the time series properties of the reconstructions. These reconstructions allow assessment of hydrologic variability over centuries to millennia and give context for assessing recent drought events. Tasks on this project included field collections; laboratory work in sample preparation, dating and measurement; and statistical work in chronology development, reconstruction, and analysis of those reconstructions. The interpretation of the reconstructions includes five main components : 1) place instrumental-period flow statistics in a long-term context, 2) quantify droughts and wet periods, 3) identify cycles in wetness and dryness, 4) check consistency with other paleoclimatic data, and 5) assess reconstructed flow variations in the context of expected scenarios of climate. A total of 16 different hydroclimatic series – 11 flow records and 5 precipitation records, were reconstructed. This report summarizes the research project products and results. The Data and Methods section of this report describes the field collections and development of tree-ring chronologies, reconstruction modeling, and methods of analyzing reconstructions. The Results section focuses on the interpretation of selected key reconstructions for the Klamath, Sacramento, and San Joaquin basins. Annual time series of the 16 reconstructions are included as products in an appendix and in a digital spreadsheet. With increasing concerns about the impact of warming temperatures on water resources, more attention is being paid the relationship between runoff and precipitation, or runoff efficiency. Temperature is a key influence on Colorado River runoff efficiency, and warming temperatures are projected to reduce runoff efficiency. Here, we investigate the nature of runoff efficiency in the upper Colorado River (UCRB) basin over the past 400 years, with a specific focus on major droughts and pluvials, and to contextualize the instrumental period. We first verify the feasibility of reconstructing runoff efficiency from tree-ring data. The reconstruction is then used to evaluate variability in runoff efficiency over periods of high and low flow, and its correspondence to a reconstruction of late runoff season UCRB temperature variability. Results indicate that runoff efficiency has played a consistent role in modulating the relationship between precipitation and streamflow over past centuries, and that temperature has likely been the key control. While negative runoff efficiency is most common during dry periods, and positive runoff efficiency during wet years, there are some instances of positive runoff efficiency moderating the impact of precipitation deficits on streamflow. Compared to past centuries, the 20th century has experienced twice as many high flow years with negative runoff efficiency, likely due to warm temperatures. These results suggest warming temperatures will continue to impact runoff efficiency in wet or dry years, and that future flows will be less than anticipated from precipitation due to warming temperatures.